Tri-Lakes Shooter’s Supply in Monument Colorado is doing well and they attribute much of their success to the burgeoning number of women shooter to whom they cater. Long gone is the stereotype of the male gun owner. 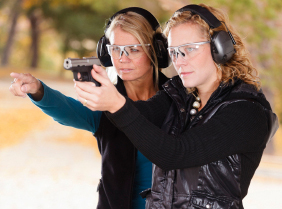 As women flock to the shooting sports and to an awareness of self-defense issues, stores like Tri-Lakes are working to make sure that women are warmly welcomed. After all, as Tri-Lakes President Angela Robbins notes, “they’re better shooters, more accurate.” Us men better watch out. We have competition and that is a very good thing for gun rights and the gun industry as a whole. This entry was posted in Colorado, Gun Sales, Winning The Culture War, Women and Guns. Bookmark the permalink.